The Winter Reading Challenge is in full swing, but it’s not too late to sign up. 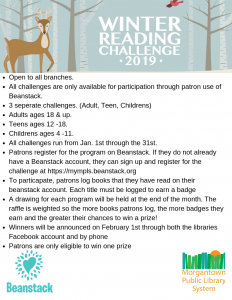 From January 1st to January 31st, 2019, Morgantown Public Library System will participate in Beanstack’s Second Annual Winter Reading Challenge, sponsored by Mark Cuban from the show Shark Tank. There are also prize incentives to read and log your reading, the more books you log, the better your chances of winning. Register or log in to Beanstack to participate and track books read here. If you’ve never used the site or the app before, stop in and we will be glad to help. MPLS is participating in a nationwide competition sponsored by Beanstack and Mark Cuban, along with over 100 other libraries and schools. If MPLS and all the other libraries reach the competition-wide collective goal of 5 million minutes and 75,000 books, Mark Cuban will donate $35,000 to split between top participating libraries. Pick up a book and get reading. Share it on social media #WinterRead2019.